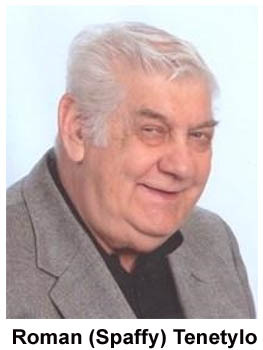 Roman Tenetylo Jr. 80, of Chambers Hill passed away peacefully Saturday, January 10, 2015 at home. He was the son of the late Roman and Mary (Marynicz) Tenetylo, born on November 18, 1934 in Coaldale, Pennsylvania. Roman was a member of St. Catherine Laboure Catholic church. He was a graduate of Coaldale High School Class of 1952. He was a member of Teamsters Local 776 and a retiree of United Parcel Service with 26 years of service. Roman was drafted into the U.S. Army and served as a radio operator with the 7th Infantry Division in Korea. He was a lifetime member and former officer of the Veterans of Foreign Wars Post 1213 in Rutherford, and also a member of the Coaldale American Legion Post 170 and the Coaldale Rod and Gun club. Roman was a world traveler and visited five continents including the Great White Continent of Antarctica and numerous sites and attractions in the United States. He was interested in auto racing, football and all sports played by his beloved Fighting Irish of Notre Dame. Survived by his loving wife of 56 years, Mary Catherine (Culley) Tenetylo and two sons, James Tenetylo (Tracie) of Camp Hill and Rob Tenetylo (Cindy), two daughters Donna Nelson (Dave) of Camp Hill and Renai Lauver (Scott) of Duncannon, and nine grandchildren, David Nelson Jr.,Jessica Sanderson, Ashley Nelson, Sarah Lauver, Stephen Lauver, Derek Tenetylo, Lauren Tenet,Brooke Tenet and Drew Tenet. He was preceded in death by three brothers Samuel, Steve and Joseph and two sisters, Ann Firkal and Julia Morgan. Mass of Christian burial will be at 12:00 PM Wednesday, January 14, 2015 in his church 4000 Derry Street Harrisburg. Rev. Joseph Howard will be officiating. Burial with military honors will be at Fort Indiantown Gap National Cemetery, Annville, Pa.